Arkham House, 1966; 321 pp. ; limited to 3500 copies. First Edition. The Dark Brotherhood and Other Pieces is a collection of stories, poems and essays by American author H.P. 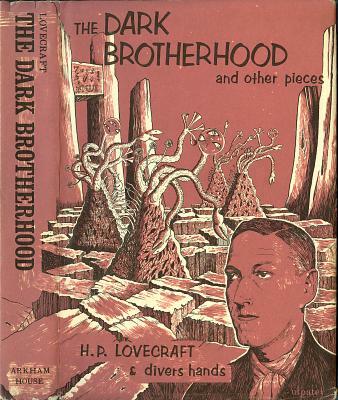 Lovecraft and others, edited by August Derleth. Book is solid and clean, without bumping; black binding cloth is clean and shiny; gilt lettering on spine is bright; pages are clean and bright. There is some minor wear on the top of the front endpaper where it appears that a thin horizontal label (about 3" x ½") was removed, and a previous price erased. Dust jacket front is clean, bright, and unblemished; flaps are clean and bright with original price ($5.00) unclipped; rear cover is clean and bright; spine and top edge are very lightly age yellowed (see image above). There is a small chip at the lower edge of the front fold, and two very small chips along the lower edge of the spine. - "On a Battlefield in France"
Three Stories by C. M. Eddy, Jr.
- "Deaf, Dumb, and Blind"
"Walks With H. P. Lovecraft", by C. M. Eddy, Jr.
"The Cancer of Superstition", by C. M. Eddy, Jr.